We have so many things going on at the moment, so we stayed up late on Friday to make time putting up our Christmas Tree. 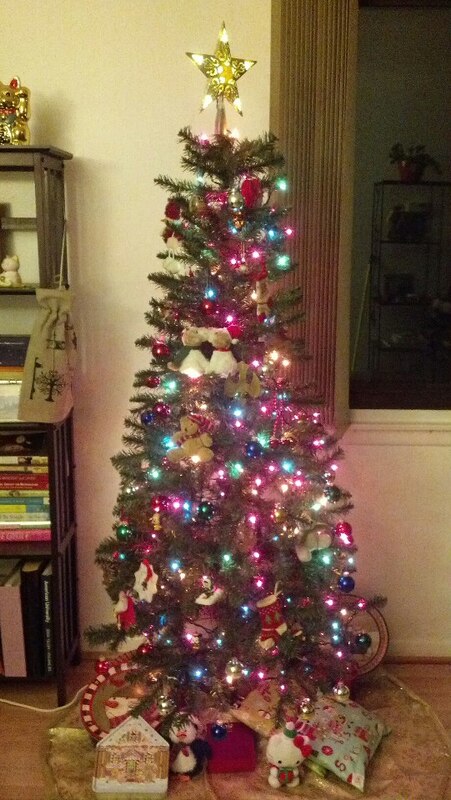 Having the tree up really makes the house cheery. It also signifies the beginning of the exciting wait for the birthday of Jesus Christ. Although most of my Christmas shopping is done, I can't celebrate yet as I am still preoccupied writing my second 15-page semester paper. It's getting harder and harder to focus on school as everything - from brightly lighted houses to Christmas sales at the mall - seems to be on Christmas break already. Are you ready for Christmas? I think I am. I just think it is coming too fast and I'll surely miss it when it's over. This is my favorite time of the year. I saw Hello Kitty down there. Our househelp did all the assembling this year as I'm too busy (I regret that part though). Setting up the tree will always be an exciting journey. Nice to see you're all set for Christmas. I'm just getting back from my Caribbean trip and the tough part of going away during this time is that it's difficult to switch back to Holiday Season mode so easily. My hubby just hauled the boxes of decors and tree from the garage, but I feel really lazy and tired to put them up tonight. So here I am blogging instead and catching up on Amazing Race. BTW, I recd the Christmas card. So very thoughtful and very much appreciated.